PartyWizz is delighted to be able to provide the authentic Santa Claus for the festive season. Santa will arrive ringing his bell, talk to all the kids (and Adults), check his ‘Naughty & Nice’ list and give out prezzies, with plenty of time for photos too! 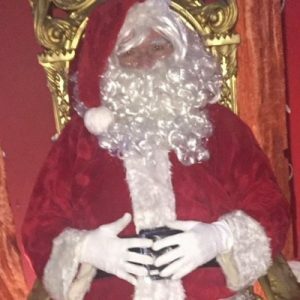 A big thanks to Shane Quilty for putting us in Contact with Santa… Shane, one of Santa’s best helpers, has for the last 5 years been putting smiles on kid’s and big kid’s faces in many weird and wonderful places. He’s worked everywhere, from the Jervis Centre Grotto to dinner parties where he arrives by helicopter. Dublin born Shane is also a magician but loves this additional string to his bow. It’s the best job in the world. I love seeing the excitement on children’s faces. What was the most difficult Christmas you can recall? The worst year was the big freeze in 2010 – there was more snow in Ireland than in the North Pole and some of the chimneys were blocked which made it very difficult to enter. How do you know if a child has been naughty or nice? Even though you only see us at Christmas, research and preparation means it’s a full-time job. My elves are around discreetly throughout the year and they keep me informed. What’s the strangest thing you’ve ever been asked for? An elephant. Very difficult to get down the chimney. But I’ve got a few for this year if anyone is interested. Does the population explosion cause a problem in terms of time and logistics? Not really. The problem is offset by using modern technology. GPS is a great time saver. Why do you always drink the whiskey but the reindeers never eat the carrots? I drink the whiskey for purely medicinal purposes but, unbeknown to most, carrots give reindeers wind. How do you enter modern homes with no chimneys or fireplaces? Good question but fortunately, there’s no place I can’t get into – even Copper Face Jacks on a Saturday night. But I could never reveal my secrets. Do you have a returns policy for unwanted gifts? Yes, I do. Unwanted gifts can be returned to me in person at: Returns counter, the North Pole from December 27th to 31st 9 am to 5 pm. Santa’s diary is always extremely busy but if you’d like him to visit you at home, your school or your office in December, you can book him through his profile.